ONCE upon a time, the animals were able to talk to one another. They talked just like humans talk to other humans. All the animals lived peacefully in the jungle. They had a king, and their king was the cat. All animals chose the cat as their king because he had all the knowledge and the skills. He was the wisest and the cleverest animals in the jungle. Other animals became his students. The cat was a generous and kind animal. He was willing to teach them everything. One of the cat's students was the tiger. He was the most obedient student. Whatever the teacher asked, the tiger was always willing to do it. Days and nights, the tiger was with the cat. He wanted to master all the cat's skills. He wanted to be the best animal in the jungle. "Master, there is one skill you haven't taught me yet," said the tiger. "It’s the skill how to climb trees. You are good at climbing trees, Master. And I want to have that skill," said the tiger. Actually, the cat had a bad feeling against the tiger. 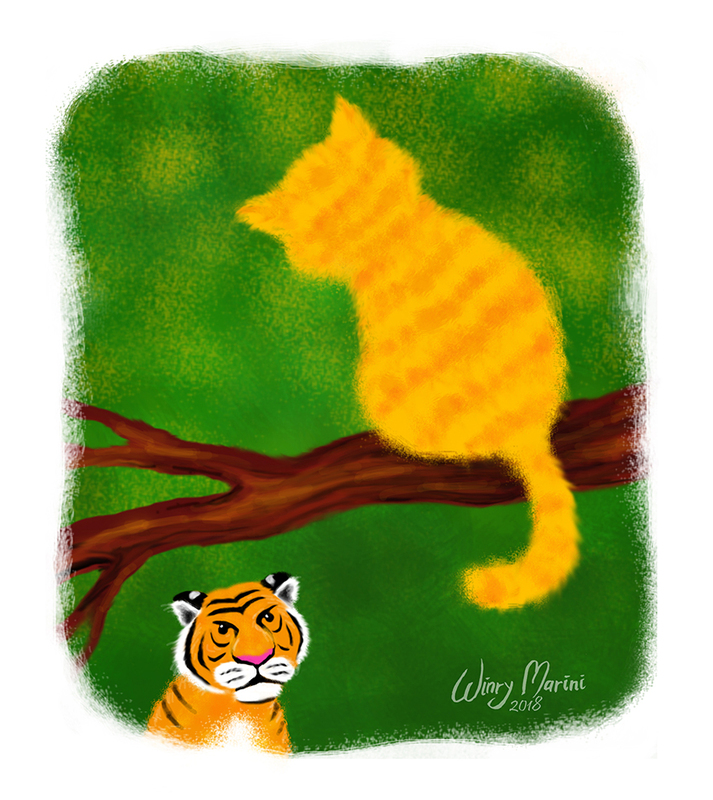 The cat did not really believe the tiger's sincerity in becoming his student. The cat did not want to teach him the skill how to climb trees. He felt the tiger would be a super animal if he mastered the skill. The cat knew the tiger's potential. Therefore he always prolonged the tiger's request. "You have to wait. You are not ready to study how to climb the tree. Let me teach you another skill. It's how to sneak," said the cat. In a very short time, the tiger mastered the skill. He could sneak perfectly. He was very happy. Then he asked his teacher to teach him how to climb the tree. And again the cat prolonged his student's request. "Wait, you haven't mastered the skill how to swim," said the cat. He hoped the tiger could not study the skill easily. He knew it's very difficult to swim. But the cat was wrong. Indeed, the tiger was a great animal. He could swim in just a minute. The tiger became restless. He had a feeling his teacher did not want to teach him how to climb trees. However he just kept his feeling in his heart. And when the cat again prolonged his request to teach him how to climb trees, the tiger became very angry. "Master, I'm your best student. And not only that, I'm your most obedient student compared to other animals. I'm always next to you days and nights and I'm willing to do anything you asked me. But why you don't teach me how to climb trees?" asked the tiger. The cat knew he could not always hide it anymore. Sooner or later he had to tell the truth. "My student, I have a reason. I don’t really believe in you. I am afraid you will use the skill to do something bad," explained the cat. "What?!" the tiger was angry. "Teach me now! Otherwise, I will kill you!" The tiger attacked the cat. And the fight could not be avoided. The tiger was bigger and had more strengths than the cat. Slowly the cat was cornered, and he had no other choice but to save himself. The cat ran away and when he found a big tree he immediately climbed it. The tiger chased him, but because he did not know how to climb trees, he just waited under the tree. The tiger screamed, "Wherever you go, I will chase you. And not only that! When you defecate, I will eat your feces!" The tiger once heard that the cat's power was in his feces.